When my nieces came to visit me last year, their one request was more hiking. I honestly had no idea they would like it as much as they did. I wanted to get them out as much as possible while still giving them a break from school. 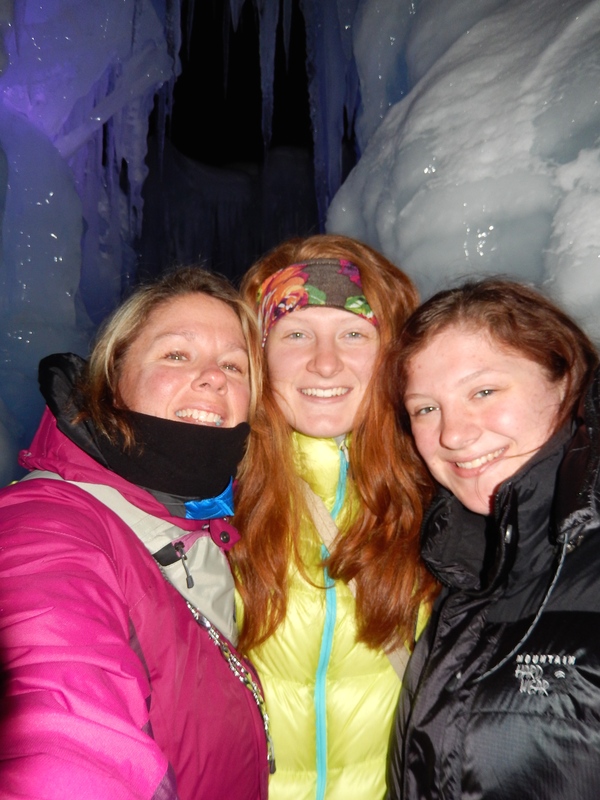 I had grand plans, hike 3/1, snowshoe 3/2, sunrise hike 3/3, break on 3/4, hike of their choice on 3/5 play 3/6 by ear…. 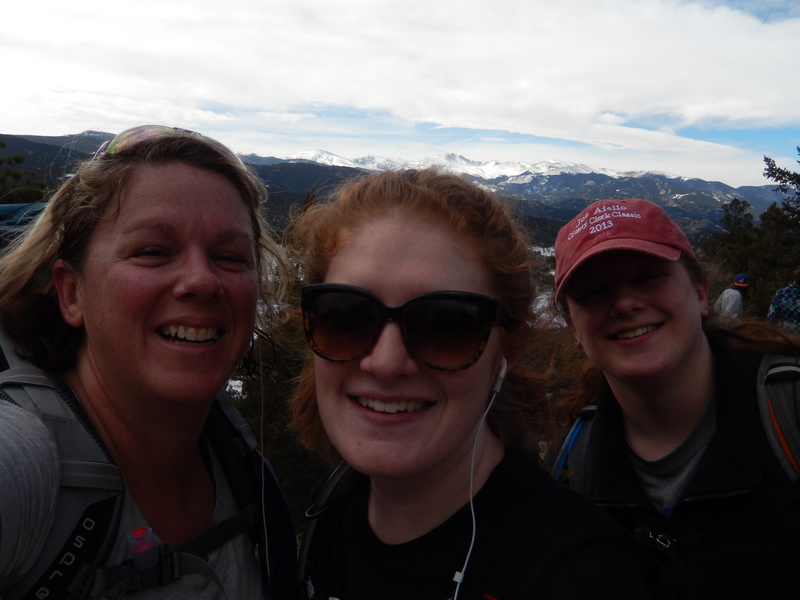 our first hike fell apart quickly while the snowshoe on 3/2 was excellent as I mentioned here. For our sunrise hike on 3/3 I was pretty uncertain we would ever be able to do it because the avalanche risk was so high all through the high country and I am not yet educated on avalanche safety and awareness. 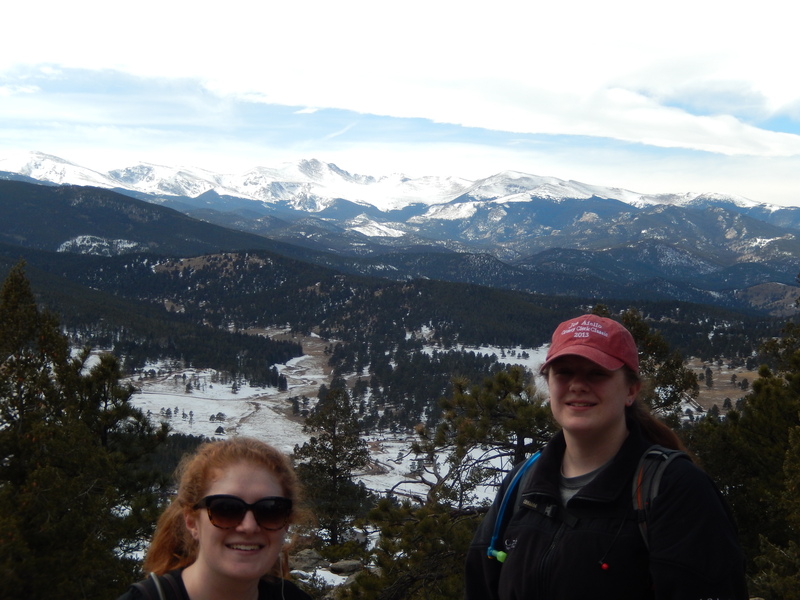 I picked a mountain that I knew was a low risk but tricky to get to, Colorado Mines Mountain. With the snow storm we had on 3/1 I wasn’t certain the road up would be open but it was so we got up at 2AM and headed out to attempt their first sunrise hike. When we arrived at the Berthoud Pass parking lot I was not expecting the 15 foot high wall of snow all around the parking lot nor Aaron getting bad coffee from 7-11. He hardly had the car in park before he was running to the warming hut vault toilets to be sick. Which I might add is one of the most awful places in the world to have that kind of situation in…. And my old negative Nellie said out loud “oh yeah we aren’t doing this”. While Aaron was being sick I told them to get their snow pants on and wait in the car while I scouted out the trail to see what we had to work with. The snow was actually hard enough to walk on and the snowshoe trail was just like Butler’s Gulch the week before in that we didn’t need snowshoes where all the other snowshoers had gone before us. I walked a good quarter-mile up without anything but my hiking boots. That walk felt good so I went back, checked on Aaron and the 3 of us adventured up the trail a bit to get a feel. I should have had them put on their snowshoes and just gone for it but I didn’t, and my lack of confidence probably contributed to their unease. 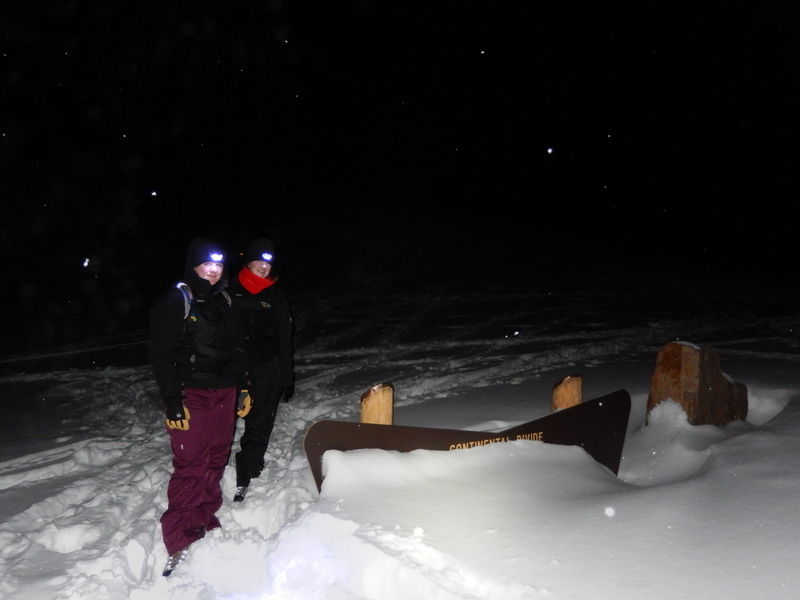 We went up about half a mile, shut off our headlamps and then turned around. We decided we would wait for sunrise in the parking lot and then head back for naps as soon as Aaron could safely leave the bathroom. We goofed around where we could and then as the sun started to rise the snow picked up along with the wind… it was almost a white out. I took a look down Berthoud pass and we weren’t going to catch any of the sunrise from there the snow was so thick in crazy blowing winds. I am still kicking myself for not just taking them up alone, I am perfectly capable but I let doubt rule me! Regardless it would have been miserable at the top with absolutely no views. I promised them that if they came in the summer we would do this again on a better mountain. On Wednesday, we hit Staunton State Park and the weather was absolutely perfect, the views were amazing and my nieces were the perfect company. We hiked about 8 of the miles Aaron and I hiked last fall. 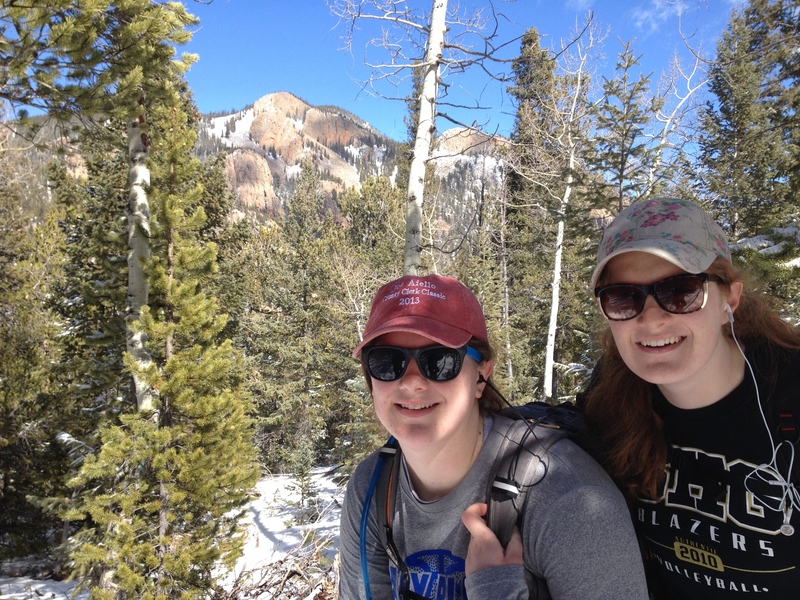 We did the Staunton Ranch trail to Scout Line, took Marmot down and then Staunton Ranch back out. The hardest part was the little bit of snow we had to contend with, it was just enough to have slipping and sliding more than we wanted too. 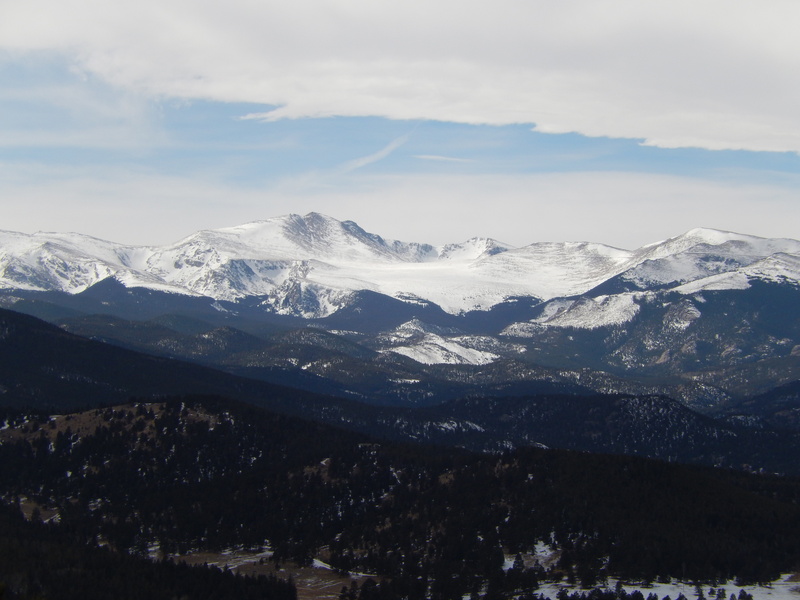 The best view on Scout line – see pikes peak? What I loved was just talking with my nieces about whatever, they are adults now and so incredibly smart it was a revelation. I found myself wanting to study again so I could keep up! 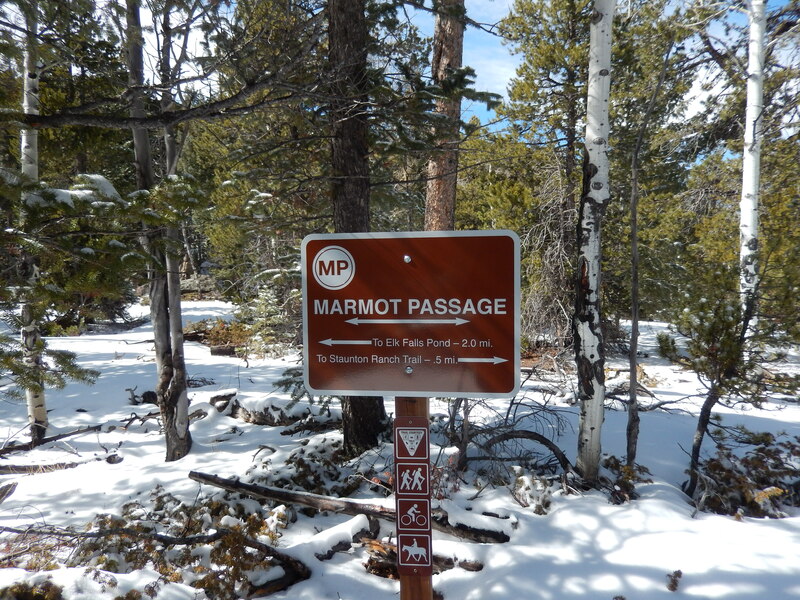 We did the length of Scout Line trail and then headed down Marmot passage to get a little loop back to Staunton Ranch trial. 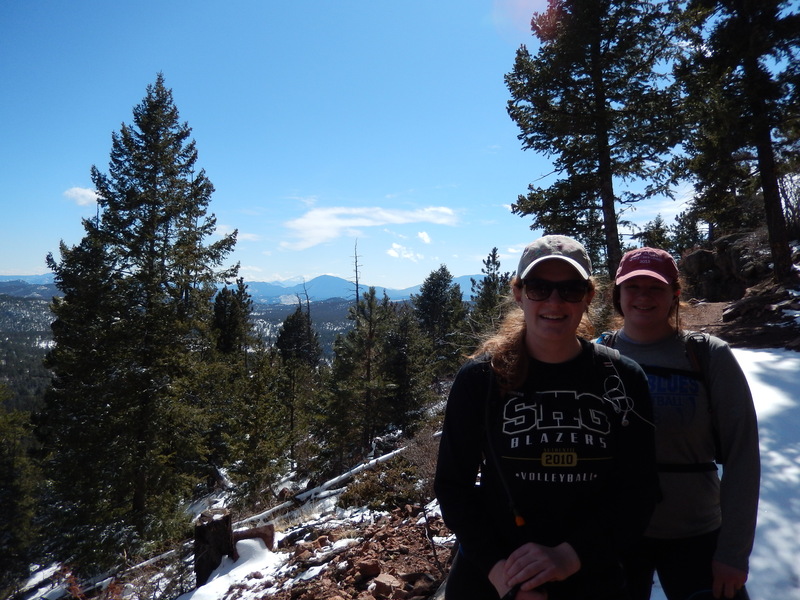 Overall it gave us 8-9 miles of hiking with perfect weather and amazing company. 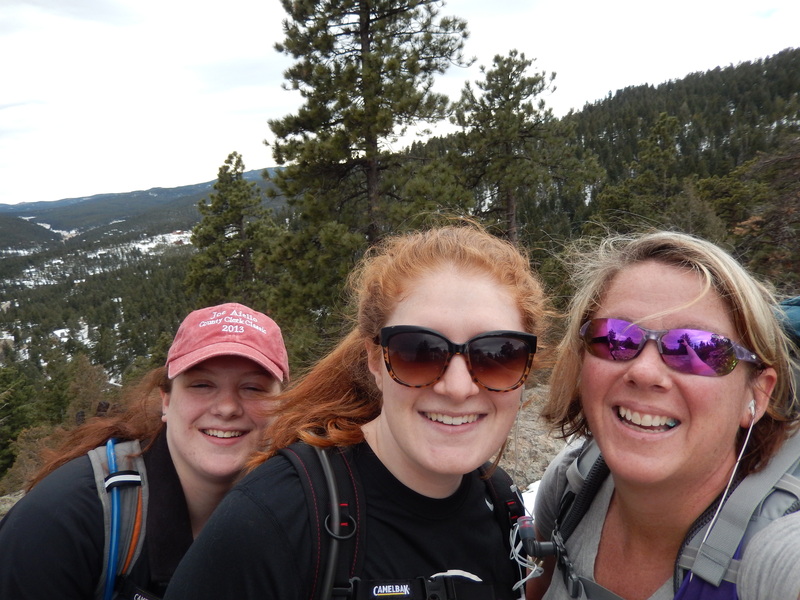 After making them hike a lot on Wednesday, my nieces were still up for another hike on Thursday so we decided that the first hike we wanted to take them on- Evergreen Mountain– would be the one to do. It was like night and day from just 5 days before. 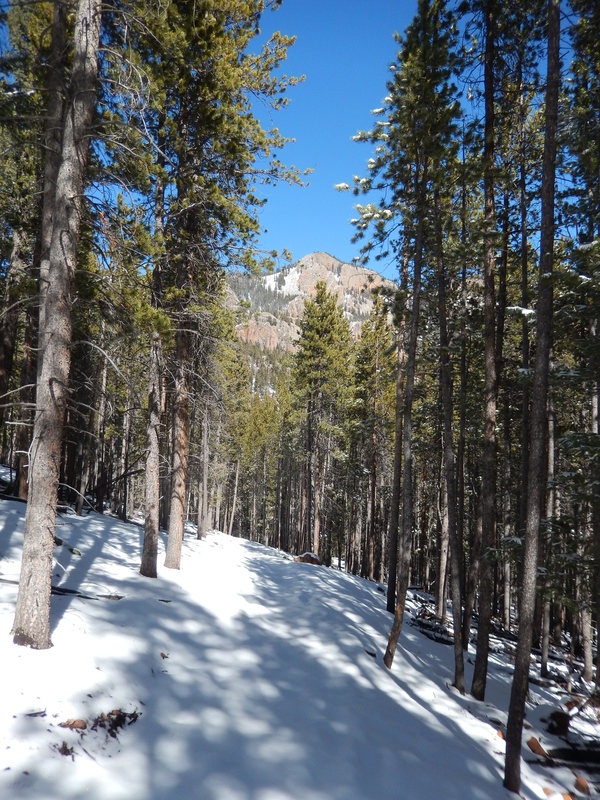 The only downside was the snow on the path with the ice underneath that snow. 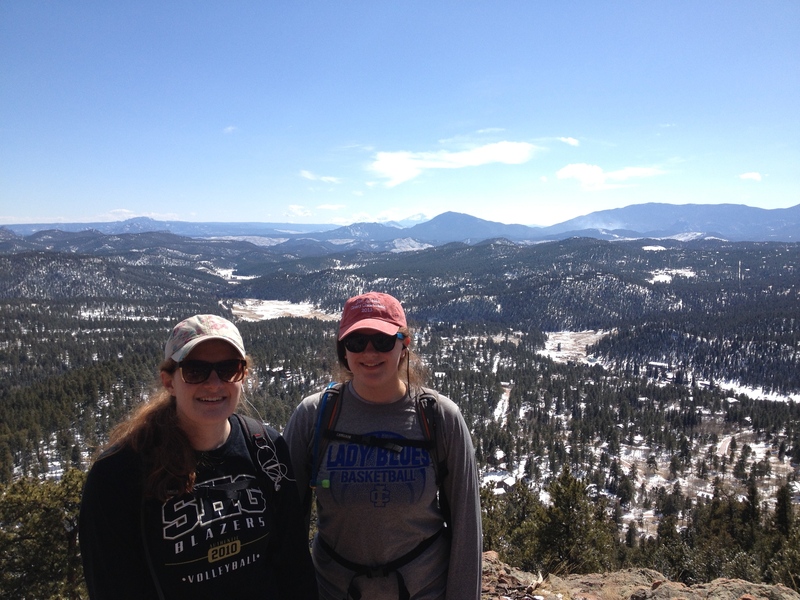 Once again Lauren and Anne proved how awesome they are! It was supposed to a warm beautiful day, and while it was warm the sun stayed hidden which meant it wasn’t as warm as we had hoped it would be. I love showing new people to this trail, when I do I usually take them to it before we hike much else only because the route up can be kind of boring after other hikes. I felt that boring aspect the most this last time with no sun and the pesky snow making us slip and slide all over the place even more than the day before. But the summit views were lovely to behold as always. I think that was the redeeming part of the hike for us all after a struggle to get up through the melting, sloppy snow… that and the drinks afterwards. This visit overall was so nice, having my nieces here made me both miss my family terribly and want to redouble my efforts to get them all to move here to Colorado…. now I am patiently waiting until my next family visit. It needs to come faster! I hope you are experiencing some form of spring awesomeness and if you are, get out there and hike, life is too short!!!! 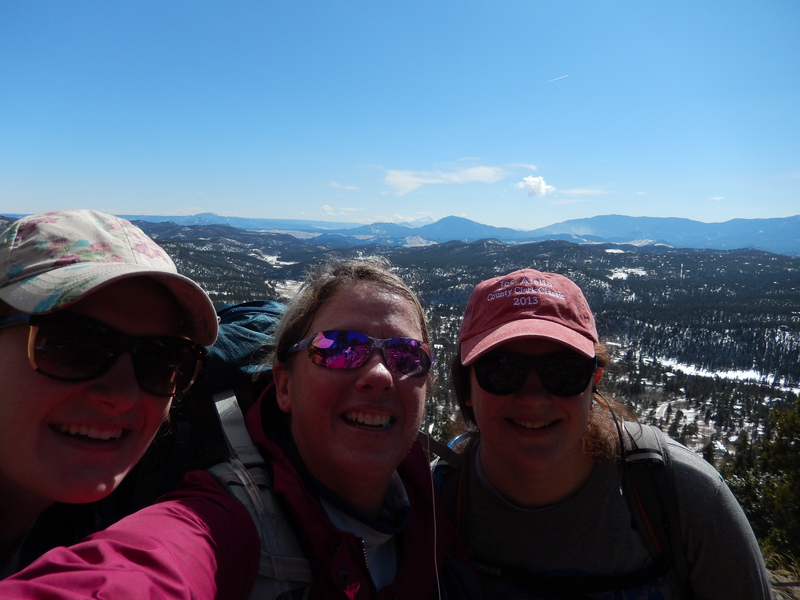 Great pics from the Scout Line Trail! Definitely can sympathize with Aaron – there are times when you thought your brain was in control, but if your digestive tract starts acting up, it can bring all your great plans to a screeching halt. Poor little guy got sick on bad coffee that is the worst. However, you took some lovely photos along the way and great sunshine! Keep Hiking!